In its mission to support journalism education, the ASBPE Foundation partnered with Northwestern University for its first Business Journalism Scholarship. Tyler Sonnemaker, a graduate student with Northwestern University’s Medill School of Journalism, Media, Integrated Marketing Communications won the first scholarship, and he’s now deep into his graduate studies and studying with a small group of other students at the school’s Technology and Business specialization. Summer reading for the group included “Bad Blood,” the story of scandal-plagued Theranos, a blood-testing company investigated by Wall Street Journal reporter John Carreyrou. After they read it, Medill arranged a Skype call between Carreyrou and Sonnemaker and the other students. Sonnemaker, who did undergraduate studies at California’s Claremont McKenna College, cofounded the Center for Innovation and Entrepreneurship during his sophomore year. And he continues to focus his journalism in that area. In his application for the scholarship, he says journalism provides him the opportunity to not only pursue his commitment to the public interest and to holding the powerful accountable, but also to apply his entrepreneurial mindset. “As a journalist, I hope to build on my collective experiences and interests to become a watchdog at the intersection of technology, law and policy,” he stated in his personal essay. 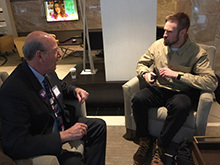 Roy Harris, past president of the ASBPE Foundation, had a chance to meet Tyler near the Evanston, Ill., campus of Northwestern in September. And Harris offered ASBPE members’ support for Tyler in his studies, and in his professional pursuits. In the future, the ASBPE Foundation plans to work with other journalism schools with a focus on business journalism to expand this initiative. To make a tax-deductible donation to the ASBPE Foundation and help fund future scholarship opportunities, visit the online form at https://asbpe.site-ym.com/donations/donate.asp?id=15242.